The Tuesday after Easter (April 6) Canon Mark left for England for what was to be two weeks (okay, “a fortnight’s”) speaking and ministry trip. Sixteen years ago he and his wife, Dr. Mary Pearson, and daughter Jennifer visited three of England’s largest Christian healing centers. Canon and Dr. Pearson had a vision for a center of healing that would combine medicine, counseling, and prayer to minister to the whole person — body, soul and spirit — with the whole team — physicians, counselors, and prayer team people. It’s one thing to have a vision. It’s only common sense to see how others are fleshing out a similar vision. So the Pearsons went to England, to Burrswood — with its thirty bed hospital, Christian counseling staff, and several healing services a week. They then went to Crowhurst, a center of healing since the 1920s, where people come either on “open admission” to stay for several days, or on a “themed week” — several days of teaching and ministry on a single aspect of one’s need for healing. Then on to Acorn where healing conferences and services are held several times a month. As you know, the Pearsons opened a center in New Hampshire in the mid 1990s, now significantly expanded. Canon Mark first spent several days in residence at Burrswood, the place with a church and a hospital as well as residential retreat center space. 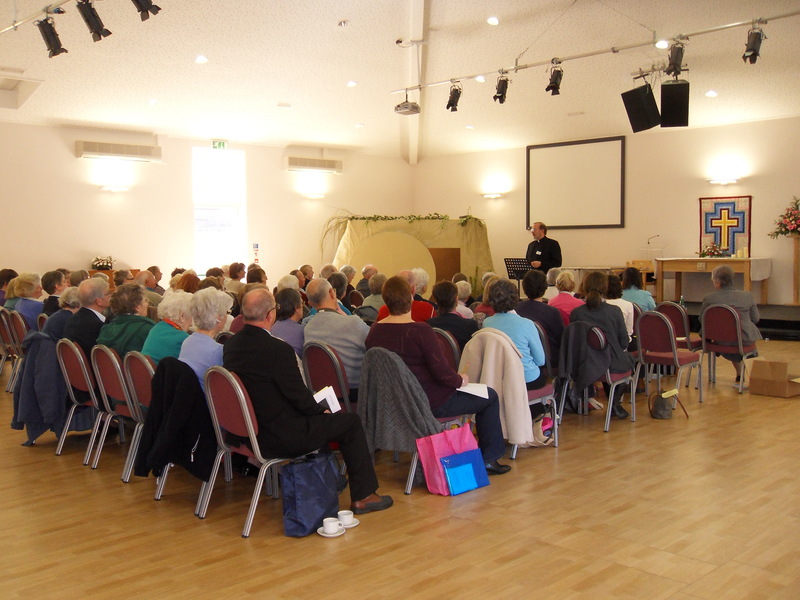 On one of his days there local church healing team members from all over the Church of England’s Diocese of Rochester gathered for a whole day’s worth of teaching. One Sunday he preached at the Sunday morning worship service, a service broadcasted into patients’ rooms. 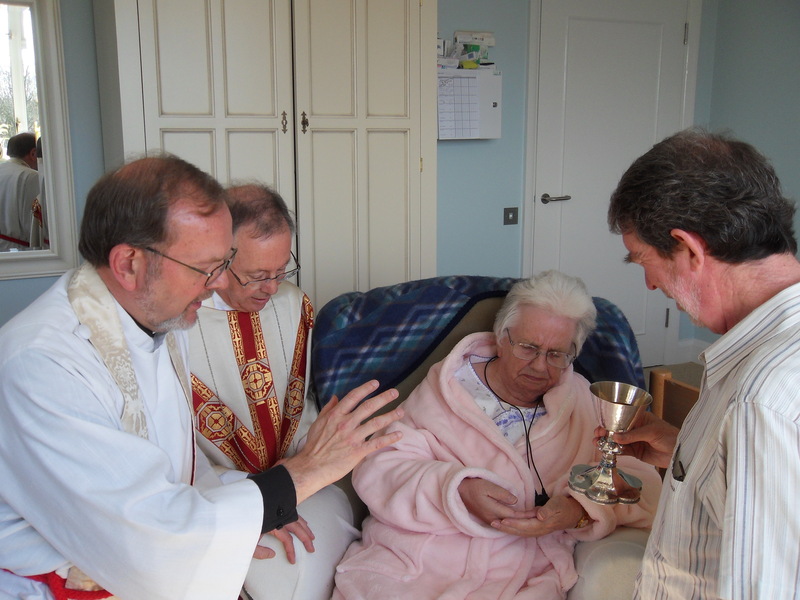 After this he, with Canon Anthony Smith, just retired as Bishop’s Chaplain, and Dr. Paul Worthley brought patients communion in their rooms and prayed with them. Then Canon Mark went to Crowhurst. Sometimes Crowhurst invites people to come for specialized ministry to particular emotional ailments. Other times the healing is packaged around something fun. He was there during “art week” — a time where people, under the guidance of a Christian artist, come to paint. Painting can be quite therapeutic, while other times it can be diagnostic — what comes to the surface while one is painting is now identified for intentional ministry. 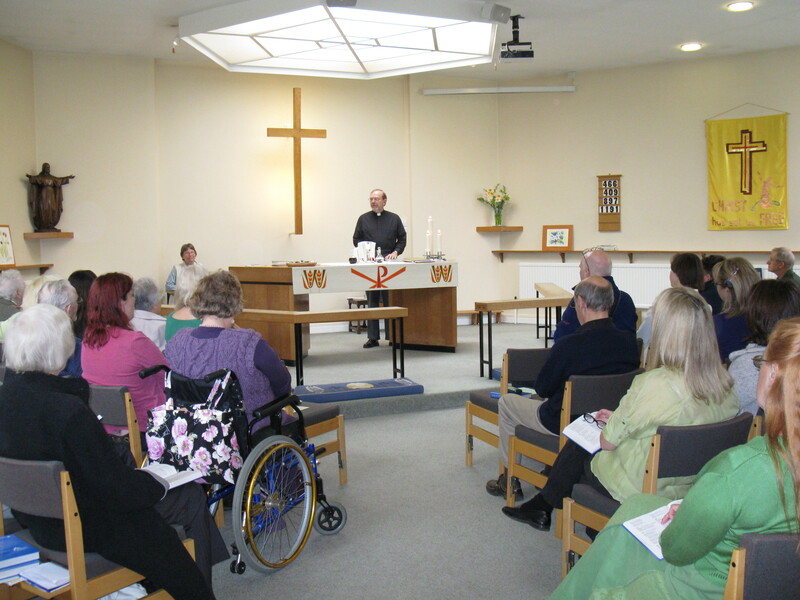 Canon Mark spoke at two of the weekly chapel healing services to near capacity congregations. After that, it was on to Acorn. Sixteen years ago Bishop Morris Maddocks was the leader. Having a retired Church of England bishop as the leader of a residential healing center helped quell the skepticism of those thinking the church’s healing ministry is just like those exaggerated television “faith healer” programs or those “throw away your medicine” cults. 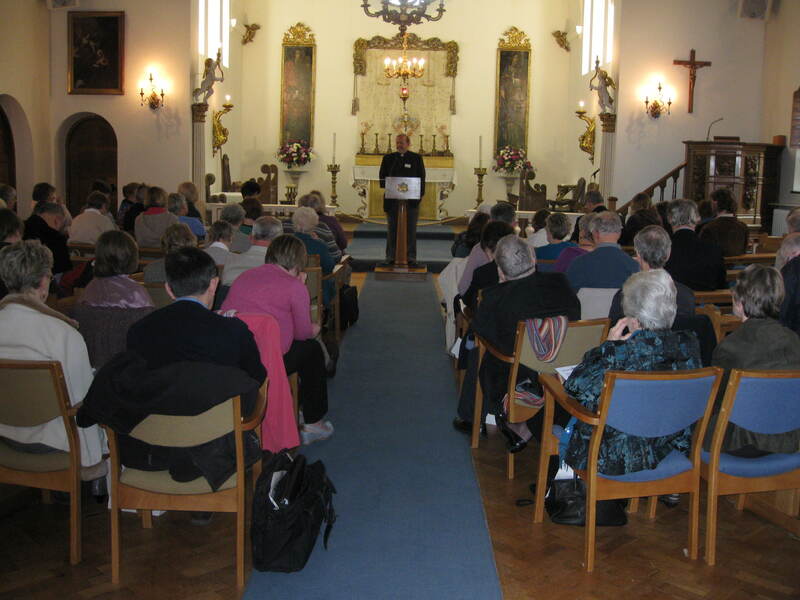 Now the leader of Acorn is Russ Parker, Church of England priest, celebrated author and internationally known speaker. 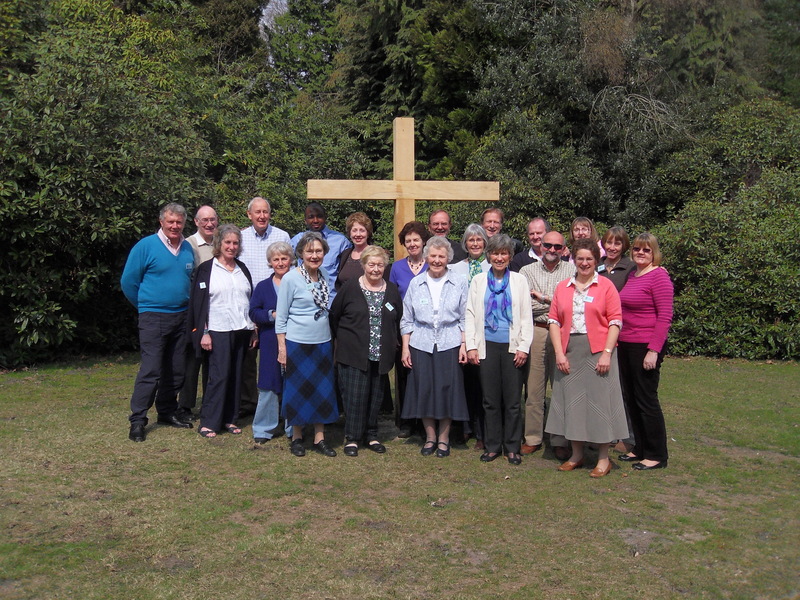 In the years since the Pearson’s 1994 visit, Acorn has erected a large cross on its back lawn. Canon Mark was invited to do a teaching day for some of the healing team members, people who come in regularly to assist in prayer ministry for those coming for a time in residence. Here’s the conference attendees with Canon Mark and Dr. Parker, by the cross. Canon Mark has been a guest teacher at several colleges and seminaries over the years. One day of his trip he was asked to give a day long series of lectures to clergy and lay preachers in the Church of England’s Diocese of Canterbury. The subject was his forthcoming book on the post resurrection appearances of Jesus. Many people assume when Jesus rose from the dead on the first Easter He kept on going right back to heaven. Actually the Bible teaches He stayed on earth for forty days before His Ascension. He did several important things during that forty day period. 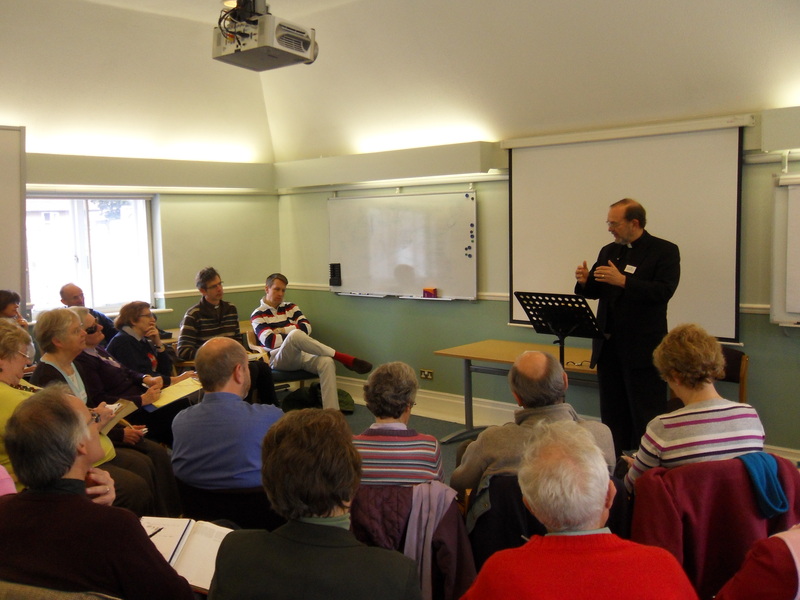 The next day, Saturday, April 17, he led a day long workshop for the healing team members of the Diocese of Canterbury. These are some of the ones who make healing prayer ministry available in local churches every Sunday after the services of worship are over. After the workshop was over Canon Mark was put on a fast train from Canterbury to London. The next day found him at St. Margaret Patten Guild church. London and much around it burned to the ground in the Great Fire of 1666. Sir Christopher Wren was tasked with rebuilding the churches and he did, nearly 50 of them. St. Margaret’s is one of these. It was not built as a parish church but as a Guild Church — for the Patten makers guild. No, not “pattern” but “patten.” A “patten” was an overshoe that would slip on over one’s regular shoes. The streets were muddy and filthy and a patten would somewhat cover one’s shoes to keep them relatively clean while traveling the filthy streets. A Philippino congregation of the Charismatic Episcopal Church rents the space on Sundays. Canon Mark preached, enjoyed a noon-day meal with them and spent the afternoon teaching. 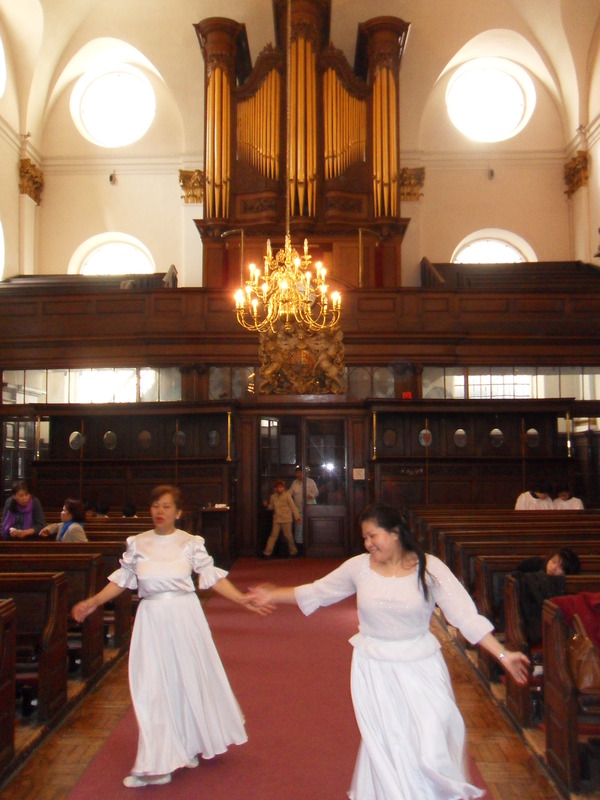 Here’s a photo of two of the members liturgical dancing. Note the beautiful organ in the rear gallery of Wren’s great church building. Canon Mark has been here before and so appreciates their gracious hospitality and love of the Lord. Like the Charismatic Episcopal Church all over the world, St. Stephen’s CEC, London, combines the “catholic” (liturgical worship, importance of the sacraments, sacred tradition), the “evangelical” (emphasis on the Bible and a personal relationship with Jesus) and the “charismatic” (the present-day move, sometimes dramatically, of the Holy Spirit). 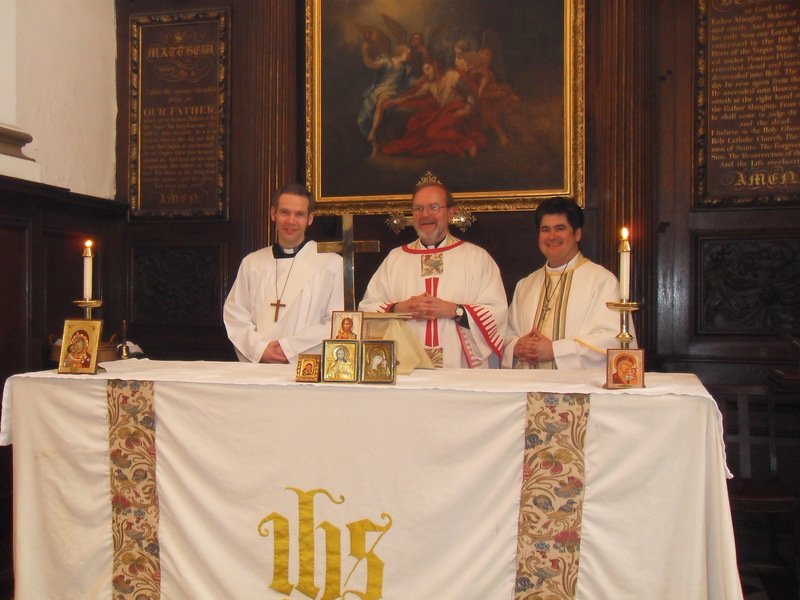 Here Canon Mark celebrates the Eucharist with Deacon Andrew Gossage and (rector of the church) Fr. Juan Bonnin. Well, supposedly the next day, Monday, April 19, he’s “a-leavin’ on a jet plane.” The volcano in Iceland had different ideas. His flight was rebooked for Saturday, April 24. What to do? The Canon lived in England for three years, returns nearly every year to minister, and has lots of friends there. So one day was a “play day.” But what about the rest? He’s been trying to get his book on the post-Resurrection appearances of Jesus finished but there’s so many other things that keep demanding his time. He has been researching the topic for several years. He had just taught on this subject nearly every day for two weeks. And now, several days in a quiet house with a word processor in front of him. Yes, the first draft of the book is nearly done. He’s carving out time each day to polish. We hope to see this book published in about eleven months … just in time for you to enjoy it in the Easter season of 2011.